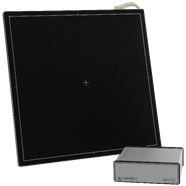 PaxScan 17×17 wired DR systems are light weight, wired ﬂat panel detectors designed for digital radiographic systems. PaxScan detectors are available in both Gadox and Cesium versions. The detector ﬁts standard 17×17” Bucky trays and its wired communication enables fast, reliable image transmission to the viewing workstation. The 17×17″ dimension makes it perfect for semi-permanent installations in table and wall-stands because the detector will not need to be rotated or repositioned. Nexus DR systems are an eﬃcient solution for your digital radiography needs. Optimized work ﬂow with this product will allow X-ray technologists to focus on the patient while easily capturing high quality images.